Avocado farming in Kenya presents a decent chance not just for farmers, however a growing population of young people to venture into. The Kenyan market whether domestic or export is growing however restricted by the production levels of the present farmers. First and foremost, common selection for the export market is that of the HASS avocado. Hass could be a semi-spreading tree requiring a minimum of a 5M by 5M planting distance at maturity. It’s a generous bearer of fruits. We at Oxfarm Organic Ltd have a privilege of interacting with farmers from central Kenya who started Hass avocado farming in 2010 from hass seedlings. Four years down the road his trees were of fruit bearing age and in 2016 his venture was commercially viable. Further interactions disclosed his preference of avocado farming to alternative crops is growing, this was when a prepared export marketplace for his product at 8-15 ksh per fruit, he delivers his product on to an exportation firm. The climatic conditions in most localities of the country square measure ideal for Hass selection farming. Hass Avocados are sensitive to wind, which might cause fruit drop and defoliation. Trees ought to be settled in safe areas. 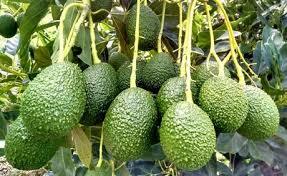 Planting of avocado trees is completed at a spacing of 5M × 5M with an acre carrying an approximation of 150 seedlings. Dig planting holes 60cm by 2ft separating top soil and the other soil, combine the top soil with 20kg of well rotten manure, take away the seed plant from the pot keeping the basis and soil structure intact, and plant the seedling using the top soil mixture. The soil is also accustomed to creating a basin round the plant. We could verify production per tree by indiscriminately sampling trees within the farm. Production averaged sixty fruits per tree, this was what we tend to be able to count and will be additional before the top of the season. Please note gather is completed double in one year. Average production per indiscriminately sampled tree yielded 600 fruits at its fifth year in one season, production is 2 seasons annually. At a median value of 10 shillings per fruit the returns per tree annually quantity to 6000 ksh. It takes one hundred or additional fruits to form a meaning financial gain of over hundred thousands ksh. Related Content: How well-planned are you for tree fruit farming this season? NB: There are many alternative Avocado fruit varieties however this is often the foremost common for the export market and includes a high production, because of its quality for domestic and export consumption it fetches high costs compared to ancient varieties. CAUTION: The Grafted seedlings verify the fruit selection for mature trees, get your seedlings from certified farmers like us. For more information kindly contact, us or visit our offices. i am in uganda how can get the hass ovacado seedlings?